It’s a simple answer, to an age-old question! How do you keep flies off your food, when eating or cooking outdoor? The answer is: you can’t - unless you’ve got a ShooAway! 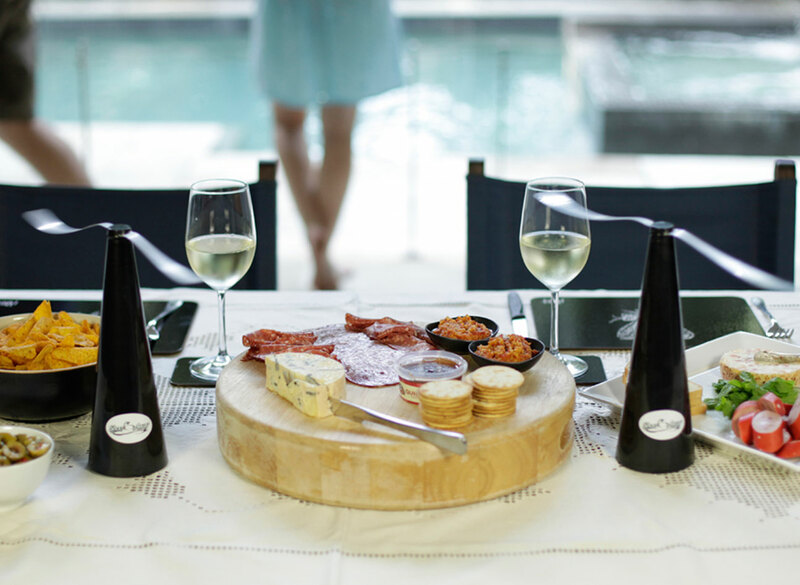 Regardless of the setting - whether you are at a BBQ, a cafe, a kids’ birthday party, or just relaxing with a plate of cheese and nibble - keep your Shooaway handy. So fly in the face of those ineffective fly control methods we’ve been putting up with for years - get a ShooAway, today, and enjoy fly-free dining forever! LIKE THOUSANDS OF OTHER SHOOAWAY USERS YOU WILL BE AMAZED AT HOW SIMPLE AND EFFECTIVE SHOOAWAY REALLY IS !!! “The Shoo-Away is a simple but very effective invention. I loved the fact that you could just turn it on before food arrived then turn it off when we’d finished eating. It is quiet, non invasive and unlike a lot of other things, there is no irritating smell. I put it in the middle of the table and found no flies came near, so it kept the whole table fly free. The cost of use with 2 AA batteries is virtually non existent. I will definitely recommend it to my friends. We’ve used the Shooaways regularly all summer and have to say that we’re really impressed. Our house is in a very rural area of South West France in the center of a farming community. We have two sheep farms about a kilometer away in opposite directions. Consequently, we do have a significant fly problem. For the last four years or so we have been using a South African flytrap called “Red Top” that we buy over the internet. It is extremely effective in reducing numbers but does’nt stop the ones around the table on the terrace where we were eating or entertaining. Your product has filled that gap perfectly for us and works a treat. I love this product, and it really works. “I love this product, and it really works. We had a BBQ to test it out and placed it outside where the food was on the table. We had flys avoiding it like it was a spray. We intend to buy two more for those days when we have big family BBQs. Its simplicity is the key.Its easy to place on the table and works.Perhaps a heavier base for those warm winds that occassionally whip up at an outside BBQ. Well done to the Inventors for making such a clean and green addition to the great Aussie dine out”. LOVE IT LOVE IT LOVE IT, it works!! The Shooaway is brilliant.and as well as on our inside and outside table I use it by the cat food bowl. It absolutely works. The trade was really easy. Very happy. great service and I love the product. Saw it a a friends house last year. This is the second unit we have purchased, very happy with both. I was really eager to try the ShooAway as we've been having a difficult time having our meals outdoors. It's very easy to use and I had it on just before setting all the food on the table. It worked pretty well as we managed to have a really enjoyable meal and the flies were kept away. 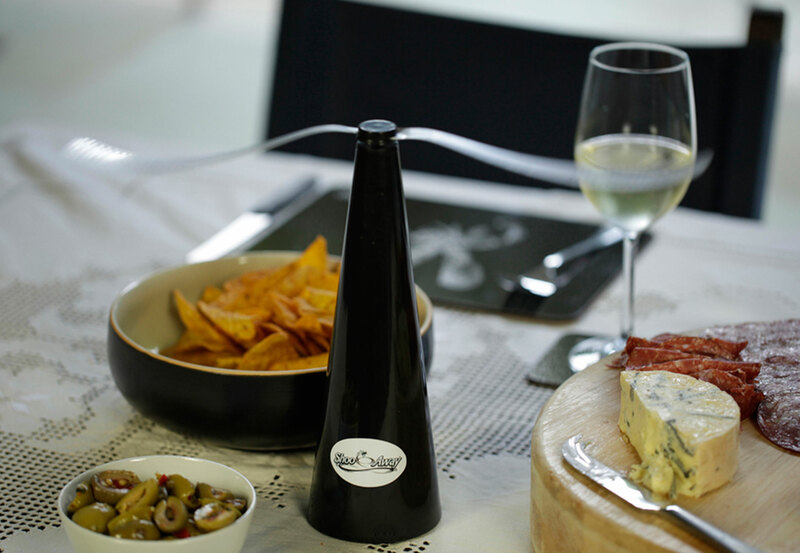 Its easy to work, silent, battery operated and no repellent odours to deal with and a hit with the kids! ...will be buying more for summer. With the extended warm weather in Autumn we have been able to extend the the times with having meals outside. This has also allowed the flies to hang around for a longer period as well. 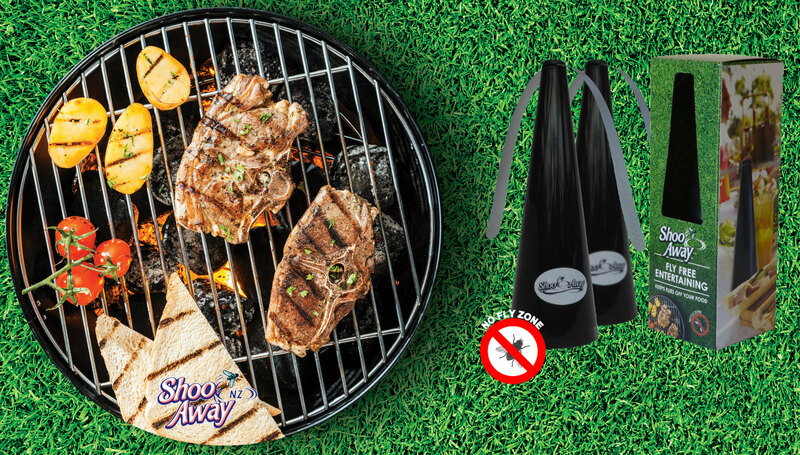 Therefore the use of the ShooAway has been required to reduce the flies getting to the wonderful foods off the BBQ. I now only need to by a few more to place over the table and over the food near the BBQ proir to cooking it all. The ShooAway is also nice and quiet so it does not take over the conversations being had at the table. Good invention and will be buying more for summer. Free shipping for 6 or more - Non Rural NZ.